PowerGrip® HTD® and Timing belts have historically been the most commonly used rubber synchronous belt profiles in the industry. Gates originated the HTD tooth profile, whose curvilinear design delivers greater load capacity than trapezoidal-toothed Timing belts. Gates offers the industry’s greatest range of standard belt lengths and widths. Gates small pitch sizes are ideal for precision positioning and light power applications, such as office machines and robotic equipment. In larger pitch sizes they are cost-effective performers in a wide range of industrial applications, such as agricultural, oil field and HVAC equipment. 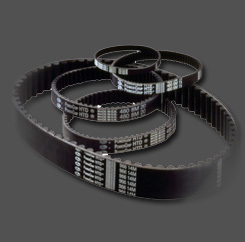 In larger pitch sizes, PowerGrip HTD and Timing belts provide synchronized power transmission for a wide range of machinery used in agriculture, construction, mining, forestry, and in the process and manufacturing industries. 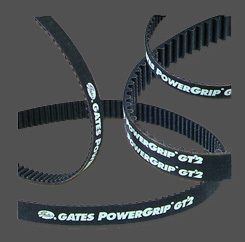 PowerGrip® HTD® and Timing belts have historically been the most commonly used rubber synchronous belt profiles in the industry. Gates originated the HTD tooth profile, whose curvilinear design delivers greater load capacity than trapezoidal-toothed Timing belts.